Back when I was still playing around with the idea of a food blog in 2009 (way before bestfoodKL became what it is today as it was just a "trial" blog), I featured Fiske Steakhouse. Maybe I've been to this eatery once or twice after that, but it has indeed been a while. Since my last visit, business has blossomed. They have renovated the place which seem more spacious and livelier (thanks to the bright lights). There are more places to eat. Fiske Steakhouse serves both local and Western food. After all, they're known for their Asam Pedas. I opted for their Western food. 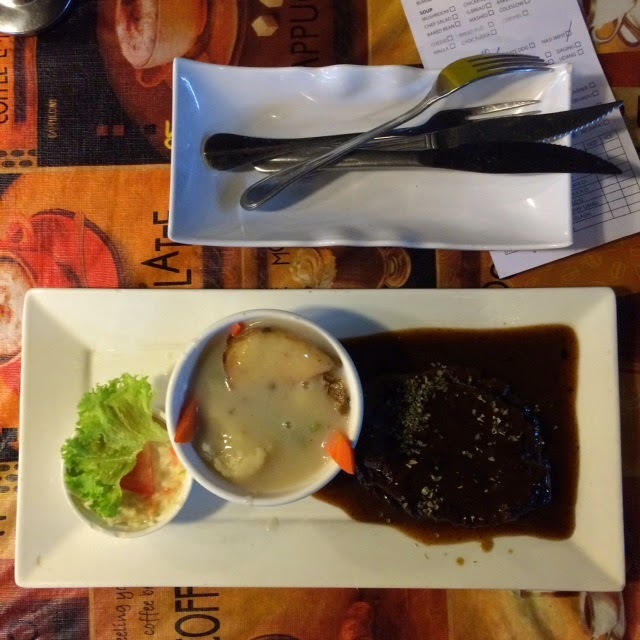 Beef Steak (RM16). Served with two sides (coleslaw and baked potato). Chicken Satay (RM1/stick). Quite pricey but luckily it's tasty. Could really taste the herbs used to marinate the chicken pieces. As for desserts, they have a range of cakes served in container box. I went with the Caramel Brownies (RM10/box). Not the best brownies I ever had, but ok lah. Definitely an awesome place to visit if you're around the neighbourhood.